A new five-year deal with Vhi Healthcare has been announced. David Gillick helped launched this partnership this morning. THE ORGANISERS OF one of the most-popular sporting events in the country have entered a new commercial partnership in a bid to further develop and grow in Ireland. 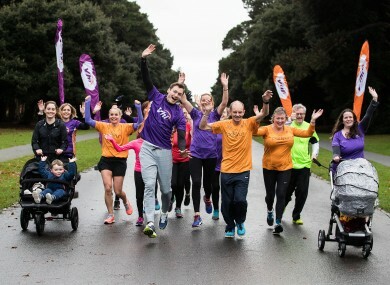 Vhi Healthcare have become the presenting partner of parkrun Ireland on a five-year deal, in a ‘groundbreaking’ agreement which both parties hope will encourage family-centered physical activity. The parkrun event — a free 5km run every Saturday morning — has experienced explosive growth since it arrived in Ireland back in November 2012 and now takes place at more than 55 venues around the country. It’s estimated that 5,000 people of every age and ability take part each week while more than 600 volunteers do unheralded work to ensure it all runs smoothly. This partnership reinforces Vhi’s longstanding association with Irish running having been title sponsor of the Women’s Mini Marathon for the last number of years. With increased funds now available, organisers hope to support existing parkrun events but also add more in other areas around the country, including the development of junior parkrun for 4-14 year olds. “We are very pleased to announce this partnership with Vhi,” Matt Shields, parkrun Ireland country manager, said. “Both Vhi and parkrun are not for profit entities that promote healthy lifestyles, so our objectives and goals are complimentary. Email “Parkrun secures 'groundbreaking' partnership to aid further growth of free event ”. Feedback on “Parkrun secures 'groundbreaking' partnership to aid further growth of free event ”.